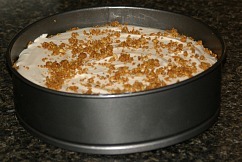 I was trying to learn how to make easy cheesecake recipes when I first started making cheesecakes. I had never tasted this creamy dessert before but I had heard from so many who really liked the flavor. You must remember that back then we did not have the fancy ones like my ultimate cheesecake or even the amaretto cheesecake selection that we do today. People described these recipes to me as having sour cream and cream cheese in the them. 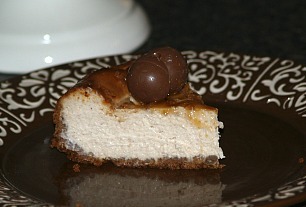 I began to try to learn how to make these easy cheesecake recipes. Now I could name many of the Philadelphia cheesecake recipes which fill this description, but then the only one that I could come up with was what I now call a classic sour cream cheesecake recipe. It is made with both of these ingredients and is simple to make. This one is baked in a pie pan like the cream cheese pie recipes. This was one reason why I could make it because back then I didn’t own a spring form pan. It can also be baked in a pre-made graham cracker crust which makes it easy. Even back then those were available. Can you believe that? 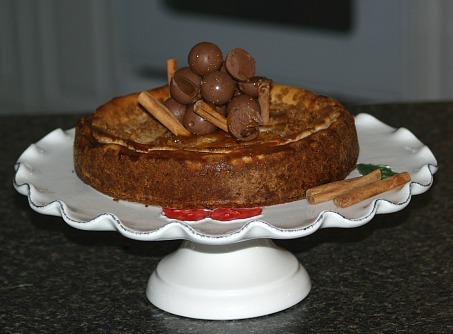 When I learned how to make this cheesecake, my husband ate the whole thing right from the pan. Today we have a large selection of easy cheesecake recipes available to us to make; even chocolate recipes and many others. It seems new ones are available every day. It is quite easy when you can assemble the entire recipe and it require (no baking) at all. There are quite a few of those. Other recipes include premixed products like cake mixes, refrigerator cookie dough, already baked cookies and pre-made cakes to use for the crust; some of the delicious tiramisu recipes use baked ladyfingers. Many of the fillings are basic and simple; to brighten them up when serving a variety of canned pie fillings will do the trick. NOTE: An easy way to make cookie crumbs for your recipes, put cookies into plastic bag and run a rolling pin back and forth until they are crumbs. Make a homemade graham cracker crust with1 1/3 cups graham cracker crumbs, ½ cup melted butter and 1/3 cup sugar; combine, mix and press into 9 inch pie plate. This easy cheesecake recipe can be made with a premade 9 inch pie graham cracker crust or make a homemade one with the above graham cracker crust recipe. Combine and mix cream cheese and ¼ cup sugar on medium speed of mixer until creamy. Add eggs beating after each; blend in 1 ½ teaspoons vanilla and lemon rind. Pour into prepared graham cracker crust; bake 30 minutes. For topping combine sour cream, 2 tablespoons sugar and 1 teaspoon vanilla; blend until smooth. Spread over cheesecake and bake 5 minutes longer. Cool to room temperature; refrigerate until cold before serving. Preheat oven to 350F degrees; butter 9 inch spring form pan and dust with flour. Combine all ingredients in a large mixing bowl; beat until light and creamy. Put cream cheese mixture in prepared pan; bake 20 minutes until top is light brown. Remove from oven and cool for 30 minutes at room temperature. Refrigerate until cold before removing sides and serving. Combine and blend cookie crumbs, sugar and butter. Press into bottom and 1 ¼ inch up sides of 9 inch spring form pan. Melt chocolate over low heat stirring until smooth. Blend eggs, corn syrup, cream and vanilla in mixing bowl until blended. Add cream cheese and beat until smooth; blend in melted chocolate. Bake 50 to 55 minutes or until set; cool on wire rack to room temperature. This is another of the classic easy cheesecake recipes but this one is baked in a spring form pan. Combine crumbs and butter; press in bottom of 9 inch spring form pan. Beat cheese until fluffy in a large mixing bowl. Pour into prepared pan; bake 50 to 55 minutes or until lightly brown around edges. Center of cheesecake will be slightly soft; cool to room temperature. Refrigerator until cold; remove side of pan just before serving. This is an easy cheesecake recipe since it has a simple graham cracker crust and very few steps in its preparation! Combine crumbs, melted butter, chopped pecans and ½ teaspoon cinnamon. Reserve 2 tablespoons crumb mixture. Press remaining crumb mixture in bottom and 1 inch up sides of 9 inch spring form pan. Beat cream cheese until smooth; add sour cream, eggs, sugar, salt, vanilla and 1 teaspoon cinnamon. Pour mixture into prepared crust; sprinkle top with reserved crumbs. Bake for 1 hour or until set; cool on rack to room temperature. 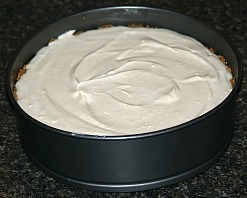 Refrigerate for 4 to 6 hours; remove sides of pan before serving. Beat cream cheese and sugar until smooth; fold in the Cool Whip. 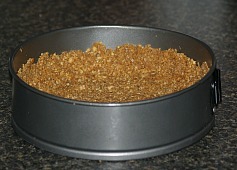 Spoon mixture into graham cracker crust; refrigerate 3 hours until set. Try making easy cheesecake recipes by using prepared crust, canned milk and topping with cherry pie filling. Beat cream cheese until creamy; add the milk gradually beating until fluffy. Beat in the lemon juice and vanilla; pour into crust and chill 2 to 3 hours. Spread pie filling over the top; refrigerate until ready to serve. Combine and mix crust ingredients; pat in bottom of 9X12 inch baking pan. Combine and beat the filling ingredients; pour over the crust without touching the sides. Bake 25 minutes or until light brown and puffy on top (Will sink as it cools). Cool to room temperature; refrigerate about 2 hours before serving.